Another snow day? or is it raining outside? The Kids are getting restless and you are out of ideas? Wondering how to keep restless kids engaged indoors? Wouldn’t it be wonderful if the mobile videos and games (Which kids love spending hours watching and playing with) are actually used to keep them physically active and wear off their energy even when they are indoors! Well that’s what Kaju does! 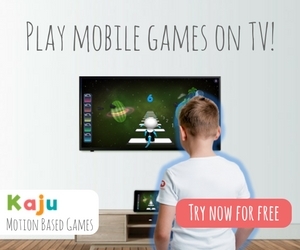 If you have a Chromecast device or an Android TV, you can cast all Kaju games, stories and learning activities on your TV for free! Isn’t that fun? Who says, fruits are only meant for eating!? Gather all your kids and their favorite fruits for this fun activity! All you have to do is slice the fruits in half and collect different color paints in paper plates. Now press the sliced fruits in the paint and then onto a blank paper to create fruit prints. Continue pressing and tapping until the paper is filled with colourful fruit prints. Planning a living room dance party or hide and seek in the dark? Make it interesting with these glow in dark balloons! Add one or two glow in dark bracelets in the balloons before blowing them up. The bracelets will glow on for hours! This is a fun activity where the entire family can participate. All you need is a bucket and a rolled up sock. Players can take turns to throw the sock-ball into the bucket. When someone scores a bucket, they will have to take a step back and try again. This process will continue till until they miss the basket. The player who shoots the ball in the bucket from the farthest distance is the winner. Had to cancel your outdoor trip due to rains? No worries, layout out your outdoor tablecloth on the floor for lunch and start a picnic indoor! ← Keeping kids active on snow days!